The best video recorder helps you capture and edit YouTube videos. Recording the screen including the audio can help you introduce your gaming flow, show how to perform a task on the computer or create a presentation. You can also upload the screen record to YouTube for free. If you want to record your screen and upload it to YouTube, there are several solutions. You can record the screen with some screen recording software on your Mac or your Windows PC, or record with some online screen recording software or the screen recording feature built in YouTube itself. In this article, we will show you how record screen and upload to YouTube on Windows and Mac with some screen recorders , some of them are free to use, or freemium, some of them are built in your computer. Check it out now. The following YouTube screen recording software can be used on Windows and Mac. You can record the entire screen or a particular part of the screen, record your own voiceover or add music to the recorded video and then upload it to YouTube directly. Filmora Scrn is a 2-in-1 screen recording software with built-in video editing tools. With Filmora Scrn, you can choose to capture the whole desktop screen or a specific area. Beside the desktop recording, you can also capture the system audio or the microphone and the webcam at the same time. With the editing tools, you can add various cursor effects, annotations, captions, overlays and banners. Apart from the basic video editing features like cut, split, delete, trim and merge, you can detach the audio from video and record your own voiceover during editing. After editing, you can share the recorded video to YouTube, Facebook, Vimeo or Twitch directly or save it in different formats. Launch Wondershare Filmora and choose Full Feature mode to begin a project. Go to the Record tab and choose Record PC Screen. There are three types of screen recording to choose from – Target Window, Full Screen and Custom. You can also choose to record computer system audio or record from microphone. Click the icons to turn them off or on accordingly. Click Settings to see if there's anything you need to adjust before recording. If you are looking for more screen recorders which can run on Windows, Mac, Linux, Android, iOS or online for different purposes, you can check our picks of the best screen recorders for all platforms based on different purposes. To record screen using Bandicam, select "Screen Recording" and a green-edged rectangle window will appear. Adjust the rectangle window on the video then play the video. Clicking the REC button will change the green-edged line of the rectangle window to red. Click the stop button to stop recording. To watch the recorded video, go to the "General" tab and click "Open." You can also upload your desired videos to YouTube from Bandicam by clicking the "Upload" button found under Bandicam's "Output" tab. You can download Microsoft Expression Encoder 4 to record the screen of your device and upload it to YouTube. The software has a screen capture tool and encoder. Install the software as you would usually do. There'll be 2 shortcuts in the start menu – Microsoft Expression Encoder 4 Screen Capture (used to capture the screen) and Microsoft Expression Encoder 4 (converts the screen into a video that can be uploaded to YouTube). Ezvid can record screen and audio simultaneously. It can also capture the whole area of the screen, making it perfect for tutorial videos. Ezvid also has speech synthesis that translates text captions into artificial human language, so it can easily produce human sound with only a click of a button. Smartpixel is a screen recorder for Android and Windows. It has a user-friendly interface and different editing as well as recording functions. Smartpixel can export various video formats such as 3gp, MP4, wmv, avi and flv. It also allows you to upload videos to different online platforms like GoPlay and YouTube. You can now also record desktop screen with the features in YouTube. To start recording the screen using YouTube, you just need to sign-in to the website using your Google Account. 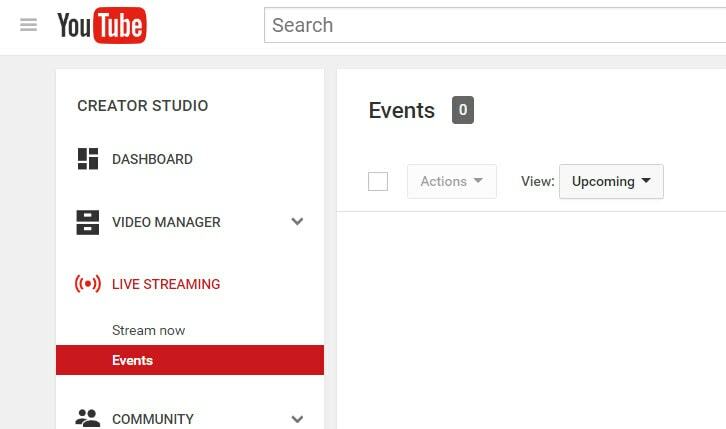 Click "Creator Studio". Go to Live Streaming and choose "Events". You'll be directed to the "Create Event" page. Provide the title for your screencast video, set the video's privacy to either Private or Unlisted. Click "Go Live Now" The Hangouts on Air page will open. Start the webcam from recording by clicking the camera icon. If you don't want to record audio, you can just click the microphone icon. Click "Screenshare" and choose a desktop window that you want to record for the screencast. Click "Start Screenshare" to share the screen then click the "Start Broadcast" button to begin recording the screen. When you're done recording, just "Stop Broadcast" and go to the YouTube website. The new screencast video is stored in your YouTube video dashboard. You can share the video or download it to your Google Drive. For more details, you can check How to record YouTube videos. QuickTime Player can be used to record movies from your camera or the screen of your iPad, iPod touch or iPhone. It can also record your Mac's screen or record audio from your microphone. To record the screen of your Pad, iPod touch or iPhone, you should use the movie-recording function. You can use it to record the screen for YouTube video, or you can also record the YouTube video and empower it with your creativity. Good to know these screen recording tools and thanks for the sharing. I always use Acethinker Screen Recorder to make screencast video for my YouTube channel, It is a cloud based software to record computer screen without install any software in your computer. Share it here as an alternative method.